& learn how by creating Richer Relationships you can create a More Satisfying life! As a counseling psychologist, pastor and organizational strategist, Dr. Shannon Mason has one aim, to connect individuals and organizations to their created purpose. Her passion is the development of strategies to help optimize gifts, and she has spent the last twenty years doing just that. Over the past twenty years she has held a variety of positions that have fed her passion for growth including as a non-profit executive director, health messaging and substance abuse researcher, adjunct professor, clinician, and family support worker. As a mission strategist her work now focuses primarily on strengthening core skills needed to navigate organizational transition. She is a senior pastor of New and Living Way Ministries, a church she planted in September 2004. Dr. Shannon Mason holds a Bachelors’ Degree in Psychology from Trenton State College, a Master’s Degree in Psychological Services from the University of Pennsylvania, and a Doctor of Philosophy Degree in Counseling Psychology from Temple University. She served for eight years as the director of children and youth services initiatives for a large community-based human services organization in Trenton, New Jersey. She also served as Executive Director of Mercer Street Friends, overseeing programs, administrative and fiscal operations, and developing initiatives for the anti-poverty organization which serves 30,000 Mercer County residents annually. What is the key to a satisfying life? 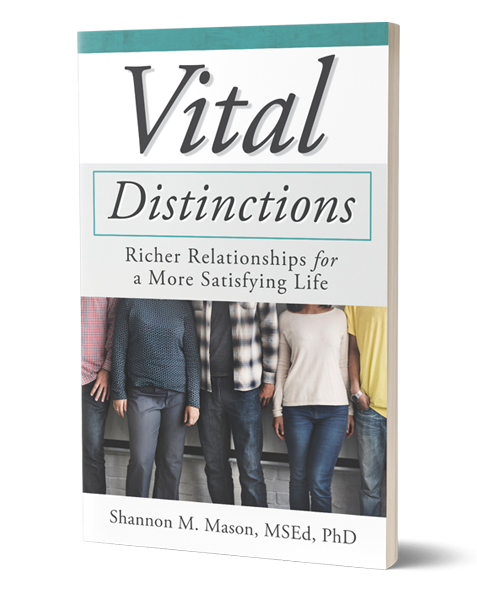 Rich relationships, says Shannon M. Mason in her book, Vital Distinctions: Richer Relationships for a More Satisfying Life. Loving God, loving self, and loving others makes the world go around, but what happens when relationships go wrong? What do we do with the disappointment and pain that makes us doubt whether relationships are even worthwhile? How do we try again when it seems so much safer not to? Dr. Mason, a pastor who also holds a Ph.d in Counseling Psychology, walks us through some of the most pressing challenges in relationships with family, friends, co-workers and loved ones, identifying common pitfalls and illuminating a way back to loving after losing our footing in relationships. Is it love or is it lust? Can I love without risk? Why do I feel so suffocated in this relationship? Will I ever be able to get my needs met? Is it time to “cut that person off?” Can this relationship be salvaged? Am I just being used? I want to stay, but how do I move beyond this pain?